Dana Perino is a popular and beloved host on Fox's The Five, with over two million followers on social media. While readers admire Dana for her charm, warmth, and insight, she also knows who the real star in her family is: her Vizsla, Jasper-A.K.A. America's Dog. In this new book, Dana tells stories about life and politics-and how dogs can transcend rancor and partisanship. She also talks about how dogs bring families together -like Dana's own, from her career in Washington through her life as a TV star. In addition to all the fun and fabulous dog tales, LET ME TELL YOU ABOUT JASPER... will be fully illustrated with hilarious photoshops so clever they will make you laugh out loud. These photoshops bring Jasper's adventures to life through pop culture, art, sports and history. Dana Perino is a Fox News Contributor and co-host of one of the most popular shows on cable television, The Five. Perino was the first Republican woman to serve as the White House Press Secretary and served for over seven years in the administration of George W. Bush, including at the Department of Justice after the terrorist attacks on 9/11. 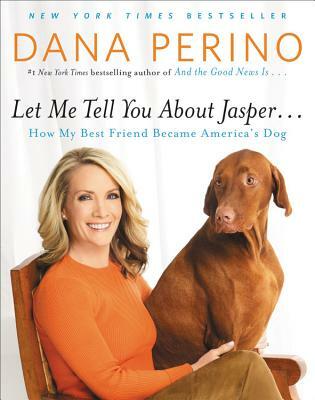 Perino lives in Manhattan with her husband, Peter McMahon, and their dog, Jasper.